the best crossword helper tools on the internet. I've included a brief description of each tool so you can decide if you want to pursue any of them further. 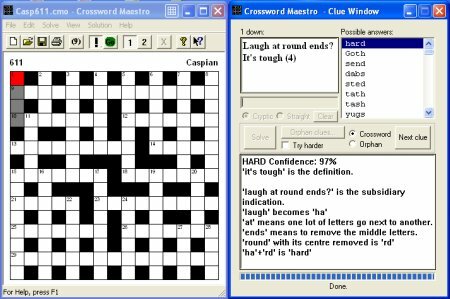 Across Lite is a crossword helper application that allows you to view and solve crossword puzzles on your computer. It is the most popular choice for online crossword-solvers. Not only because it is so user-friendly, but also because it is absolutely FREE. NOTE - Formatting a .puz file manually like this is a very tedious affair - the advantage being, of course, that it's free. If you are using the industry-standard Crossword Compiler to construct your puzzles, you can output to the .puz format automatically. You can download Across Lite here, or read a little bit more about Across Lite here. 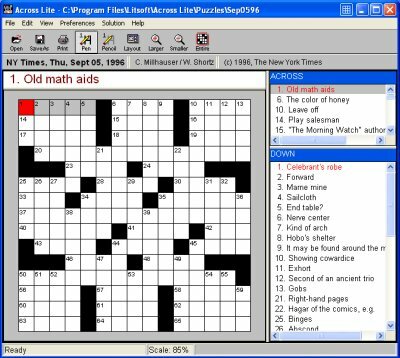 Crossword Compiler is used to create the crosswords for most of the biggest American newspapers. It is also used to create the feature crossword puzzles here at Word-Buff. 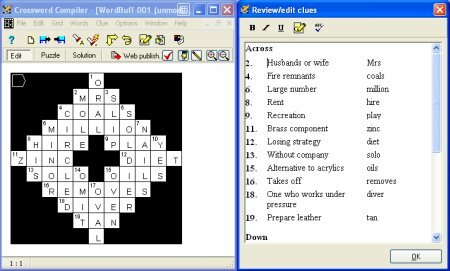 Crossword Maestro is a very high-powered crossword helper dedicated to solving cryptic clues. It was built by William Tunstall-Pedoe, who is the Artificial Intelligence guru behind the widely acclaimed Anagram Genius, which I've talked about elsewhere. NOTE - Actually, Crossword Maestro is also capable of solving standard, American-style, crosswords, however cryptic crosswords are its forte. 'It's tough' is the definition. 'laugh at round ends' is the subsidiary indication. 'at' means one lot of letters goes next to another. 'ends' means to remove the middle letters. 'round' with its centre removed is 'rd'. 'ha' + 'rd' is 'hard'. I find this is a great tool for learning how to solve cryptic crossword puzzles, because every step in the solving process is outlined for me (btw. it gets the right answer 75-100% of the time). If you're a setter of cryptic crosswords, you can use Crossword Maestro to test the clues you've come up with to see if it can arrive at the right answers, before you inflict them on an unsuspecting human! If you're into cryptics, Crossword Maestro is probably the best crossword helper you'll find.